1918: Launched by A. Hall & Co Ltd, Aberdeen (Yd.No.542) (“Admiralty” drifter) for The Admiralty as HORIZON (Ad.No.3905). 30.8.1918: Completed as a minesweeper (1-6pdr). 1949: Sold to The Thule Fishing Co Ltd, Fraserburgh. 1951: Sold to Paul O. Williment, Gorleston. Fraserburgh registry closed. Registered at Yarmouth (YH117). 5/6.1952: Seasonal landing at Fleetwood. 1955: Sold to G. R. Newsom, Gt. Yarmouth & R. Hewett, Winterton. Registered at Yarmouth as AMARANTH (YH117). 1956: Sold to Jacques Bakker en Zonen, Bruges for breaking up. 31/12/2012: Page published. 3 updates since then. This entry was posted in Drifter/Trawler, Seasonal Visitors, Steamers (Picture) and tagged Drifter/Trawler, No Fleetwood owners, Seasonal Visitors on December 31, 2012 by Fred Smith. 1918: Ordered by The Admiralty from Colby Brothers Ltd, Oulton Broad (“Admiralty drifter”) as “WINDHOWL”. 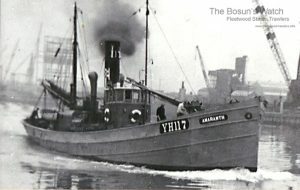 1919: Launched (Yd.No.73) for East Anglian Red Star Fishing Co Ltd (64/64), Norwich as “HARNSER”. 3.12.1919: Registered at Lowestoft (LT627). John Victor Breech, Lowestoft, manager. 23.12.1919: Struck Lowestoft Pier causing damage. 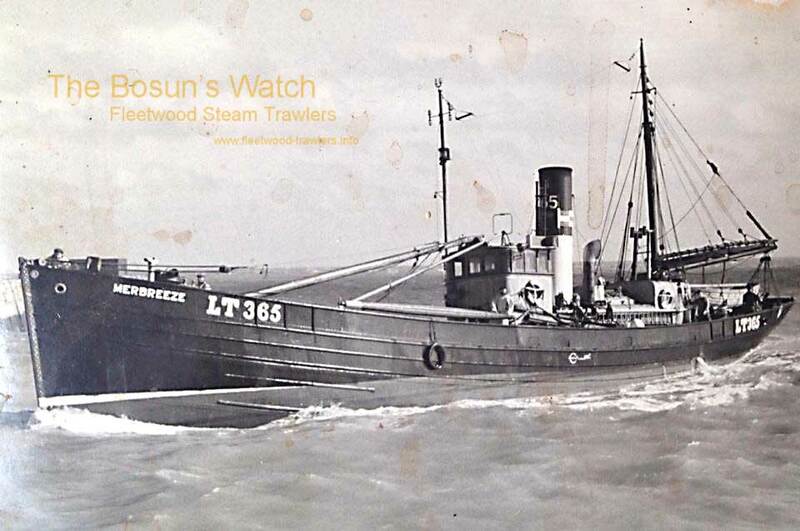 24.4.1926: Sold to Jack Breech Ltd (64/64), Lowestoft (John Victor Breech, manager). 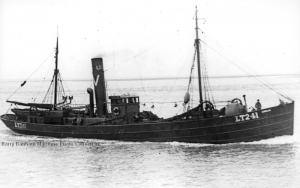 26.1.1928: Anchored off Buncrana, Co. Donegal, dragged and grounded when steam drifter SHEPHERD LAD (LT7) made fast alongside. 21.1.1933: Off Milford Haven rudder damaged. 1.9.1934: Off Peel, IoM in collision and damaged stem. 6.2.1937: At Lowestoft struck Inner Pier damaging stem. 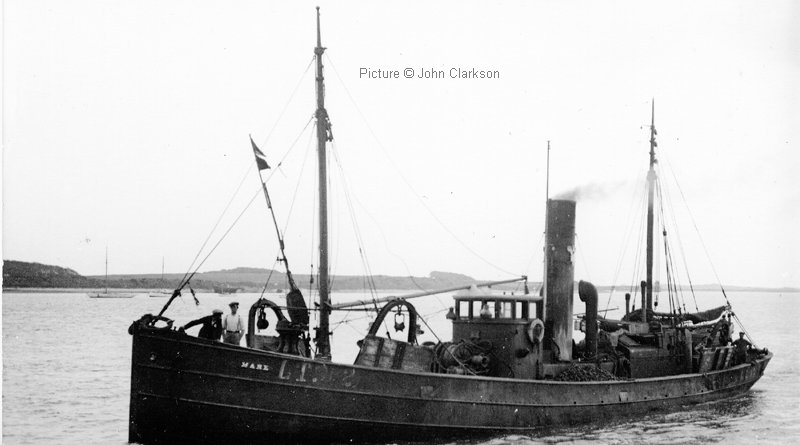 1930s: Seasonal fishing in the Irish Sea and off west coast of Ireland, occasional landings at Fleetwood taking bunkers. 24.6.1938: At Fleetwood landed 300 small boxes of herring grossed £153. 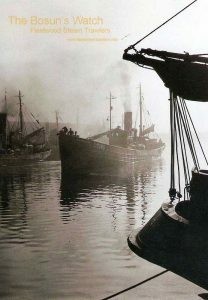 5.1939: Sold to Bröderene Anda, Stavanger (John & Trygve Anda). 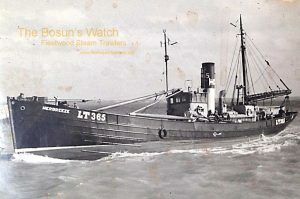 24.5.1939: Sailed Lowestoft for Norway. 1.6.1939: Lowestoft registry closed “Sold to Norwegians”. 1940: Registered at Stavanger as “ANKER I” following conversion. 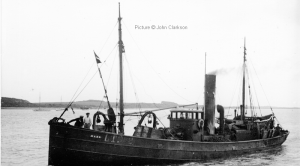 2.1940: Converted to a purse seiner and cargo vessel. 2.1940: Converted to motor and fitted with 2-cyl Wichmann oil engine, (reconditioned by Haldorsen-Sonner, built 1920). 1.3.1940: Sold to Ola Olsen, Jakob & Konrad Jakobsen, Auklandshamn (Ola Olsen, manager). Registered at Haugesund. Employed as a coaster. 11.1940: Sold to Jacob Lindberg, Kjøpsvik. Registered at Bergen as KJØPSVIK. Employed seasonal fishing and as a coaster. 1964: Re-engined with 180bhp Wichmann oil engine. 1973: Sold to A/S Dyrøgutt, Gibostad. Renamed “DYRØGUTT”. 197? : Sold to Leif Tøllefsen, Svolvaer. 197? : Sold to Arene Larsen, Henningsvaer. 198? : Sold to Harald Nygård, Hasvik. Renamed “HEIMSUND”. 1985: Condemned and deleted from Norwegian register. 07/11/2012: Page published. 5 updates since then. This entry was posted in Drifter/Trawler, Seasonal Visitors, Steam Trawlers, Steamers (Picture) and tagged Admiralty Drifter, Drifter/Trawler, No Fleetwood owners, Seasonal Visitors on November 7, 2012 by Fred Smith. 1931: Launched by S. Richards & Co Ltd, Lowestoft (Yd.No.245) for Alan Howard Watson, Lowestoft as MERBREEZE. 9.1931: Completed at a cost of £6,550. (Allan Howard Watson managing owner). 24.9.1931: Registered at Lowestoft (LT253). 1930s: Seasonal white fish trawling from Padstow and Fleetwood (William Head, Lowestoft, managing agent). 3.5.1932: Sold to P. W. Watson & Sons Ltd, Lowestoft (Alan Howard Watson, manager). 21.11.1939: Requisitioned for war service as a minesweeping drifter (P.No.FY.953) (Hire rate £69.3.6d/month). 6.1940: Based Swansea (Ty/Sk. W. G. A. Thompson RNR). 1.1942: Based Londonderry (Ty/Lieut. H. Wright RNVR). 11.6.1943: Compulsorily acquired by M.O.W.T. Re deployed as a minesweeping drifter. 10.1944: Employed on miscellaneous Naval duties. 1946: Transferred to Ministry of Transport. 2.1948: Sold to P. W. Watson & Sons Ltd, Lowestoft (Allan H. Watson, manager). 27.2.1948: Registered at Lowestoft (LT365). 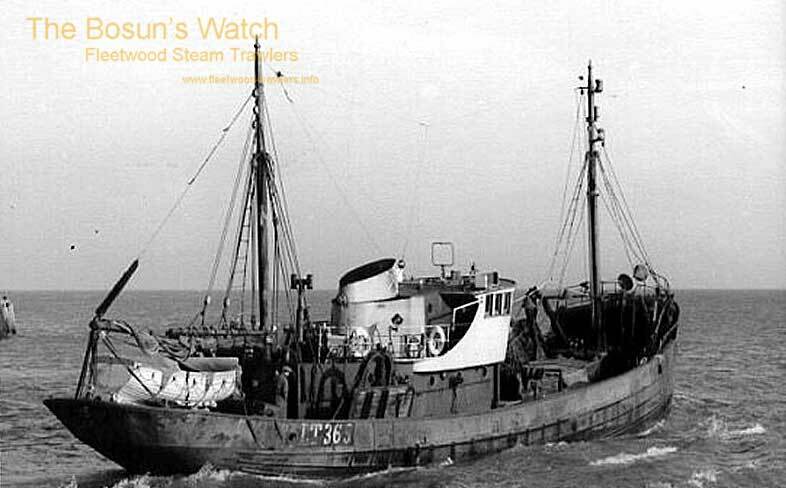 27.7.1955: Sold to The Breeze Co (Lowestoft) Ltd, Lowestoft (Allan H. Watson, Beccles, manager). 25.2.1958: Sold to Charles Henry Eastick, Gt. Yarmouth. 2.7.1959: Sold to Merbreeze Ltd, Lowestoft (John George Mitchell, manager). 14.10.1959: Completed conversion to motor by Richards Ironworks Ltd, Lowestoft and fitted with 6-cyl 360bhp 4 stroke oil engine by Ruston & Hornsby Ltd, Lincoln. 14.10.1959: Surveyed and re measured 122g 42n. 28.10.1959: Trials on completion of conversion to motor. 26.11.1975: Sold to Colne Fishing Co Ltd, Luton (John Leggett, Lowestoft, manager). 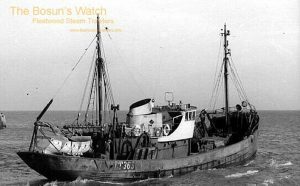 18.12.1975: Lowestoft registry (Part I) closed “Vessel no longer fishing”. Stripped of all usable parts including main engine. 1975: Engine removed, rebuilt by L.B.S. Engineering Ltd, Lowestoft and fitted in offshore platform standby safety vessel KINGFISH. 1976: Sold to T. G. Darling, Oulton Broad, Lowestoft for breaking up by East Anglian Reclamation Ltd at Nelson Wharf, Oulton Broad. 13.10.1976: Lowestoft registry (Part IV) closed “Vessel broken up”. 11/01/2019: Removed FMHT watermarks from images. This entry was posted in Drifter/Trawler, Seasonal Visitors, Steam Trawlers, Steamers (Picture) and tagged Drifter/Trawler, No Fleetwood owners, Seasonal Visitors on October 5, 2012 by Fred Smith. Note spelling of name with the accented E (MARÉ) is correct. MARE is used to allow the search engine to find the entry. 1911: Launched by John Duthie Torry Shipbuilders, Aberdeen (Yd.No.355) for Joseph Johnston & Sons Ltd, Montrose as MARÉ. 6.1911: Completed (William D. Johnston Jnr, manager). 12.6.1911: Registered at Montrose (ME156). 7.1915: Requisitioned for war service as an A/S net drifter. (1-3pdr) (Ad.No.2200). Post 12.3.1919: Returned to owner at Montrose (J. Johnstone & Sons Ltd, Montrose). 3.1921: Sold to William Widram, Eyemouth (managing owner). 21.3.1921: Montrose registry closed. Registered at Berwick-on-Tweed (BK416). 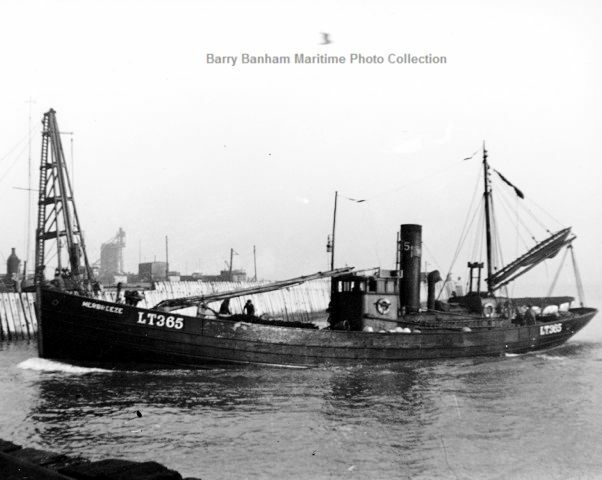 11.1927: Sold to Frank C. Burton, Lowestoft (managing owner). 29.11.1927: Registered at Lowestoft (LT362). 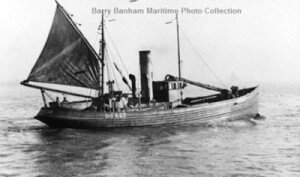 22.12.1927: Sold to Provincial Fishing Co Ltd, Lowestoft (Frank C. Burton) (Arthur Gouldby, manager). 22.4.1930: Frank C. Burton died. 22.5.1933: In accordance with terms of Will vessel registered to Edith Clara Burton (16/64), Clement Ernest Burton (16/64), Arthur Gouldby (16/64), George Mitchell (16/64), trading as Provincial Fishing Co Ltd (Arthur Gouldby, manager). 1936: Seasonal trawling from Fleetwood (New Docks Steam Trawling Co (Fleetwood) Ltd, managing agents). 13.7.1936: Last landing at Fleetwood, 48 boxes grossed £96. Laid up at Fleetwood. 1.1937: Sailed Fleetwood for Milford. 31.1.1937: Landed at Milford (Sk. Walter Aldridge Jnr). 10.2.1937: Sold to Kenneth Llewellyn, Milford Haven (16/64), Sk. John William Chenery, Lowestoft (16/64), George Mitchell, Lowestoft (16/64), Arthur Claude Mitchell, Lowestoft (16/64) (Arthur Claude Mitchell, manager). 20.8.1938: On a trip from Milford (Sk. Jack Chenery). Responded to distress from Glasgow steam coaster GIRASOL (648grt/1926) off Pembroke coast abandoned with severe list due to cargo shifting and crew picked up by Glasgow steamer SHUNA (1575grt/1937) and Liverpool steamer AGUILA (3255grt/1917). Having stood by and vessel had not foundered, boarded and at 6.20 pm. connected and commenced tow to Milford. 21.8.1934: Delivered Milford at 9.00 am and beached. 28.11.1939: Requisitioned for war service as on balloon barrage (P.No.FY1508) (Hire rate £25.0.0d/month). 6.1940: At Dunkirk evacuation (Operation Dynamo). 1940: Fitted out as a minesweeper (Hire rate £26.2.9d/month). Based Lowestoft, Harwich, Felixstowe. 1.1942: Based at Ipswich as Armed Patrol Drifter (2-MGs (1×2)). 1946: Sold for breaking up. 20/05/2012: Page published. 4 updates since then. 27/11/2017: Removed FMHT watermark from image and repaired broken link. This entry was posted in Drifter/Trawler, Seasonal Visitors, Steam Trawlers, Steamers (Picture) and tagged Drifter/Trawler, No Fleetwood owners, Seasonal Visitors on May 20, 2012 by Fred Smith. 1917: Completed by Gebr. Boot, Leiderdorp, The Netherlands (Yd.No.1037) for N.V. Exploitatie & Administratie Maats “Shamrock I”, IJmuiden (S. Koster, manager) as AMALIA. Registered IJmuiden (IJM324). 12.1930: Sold to Hobsons & Co (Lowestoft) Ltd, Lowestoft (Charles W. Dance, manager) (£2550) to fish from Fleetwood. 19.12.1930: Registered at Lowestoft (LT241). 20.11.1930: Sold to Vigilant Fishing Co Ltd, Lowestoft (J. C. Hayward, manager). 1930: G. F. Spashett appointed manager. 1932: Fishing from Lowestoft, Padstow, Milford and Fleetwood (Alex Keay, managing agent at Fleetwood). 12.4.1933: Sustained damage in collision with HERCULES (FD172). 1936: Fishing from Fleetwood (Alex Keay, managing agent). 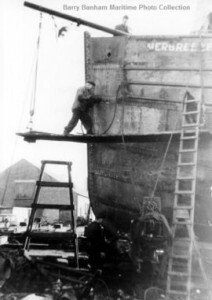 13.4.1938: Damaged stern while berthing at Fleetwood. 1.7.1938: Sustained damage in collision with dredger at Fleetwood. 1.7.1938: Sustained broken tailshaft, THRIFTY (LT152) connected and delivered Fleetwood. 27.11.1939: Requisitioned for war service as a minesweeper (P.No. FY.1502) (Hire rate £33.12.0d/month). 4.1943: Transferred to miscellaneous Naval duties. 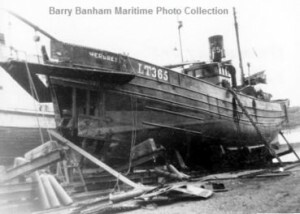 1946: Sold to Ole Vea, Akrehamn, Haugesund, Norway. Lowestoft registry closed. Registered at Haugesund as EGGÖY. 1949: Re-engined with 2stroke 4-cyl oil engine by Frederikshavns Jernst. & Msk., Frederikshavns. 1954: Lengthened to 38,46 (126.2) (loa) 191g 84n. 1960: Re-engined with 298kW (460bhp) 2stroke 6-cyl oil engine by Alpha-Diesel A/S, Falkenburg. Post1963: Owners restyled Ole Vea Partrederi, Akrehamn, Haugesund. Post 1977: Sold for breaking up. 19/05/2012: Page published. 4 updates since then. 28/12/2017: Removed FMHT watermark from image. 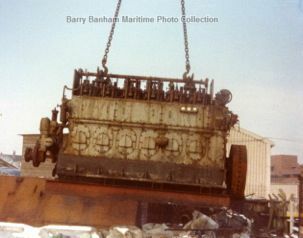 This entry was posted in Drifter/Trawler, Seasonal Visitors, Steam Trawlers, Steamers (Picture) and tagged Drifter/Trawler, No Fleetwood owners, Seasonal Visitors on May 19, 2012 by Fred Smith.